An emerald green alligator wallet made from genuine crocodile leather. This custom crocodile skin wallet is made from the underside of this prehistoric beast. We’ve added a contrasting black crocodile skin interior for a unique and luxurious touch to the classic crocodile leather wallet. 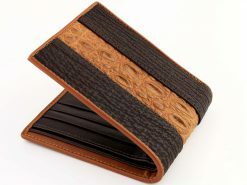 So many men choose the standard black or brown wallet that they’ve always had. Step out of that comfort zone, liven things up and go green with our take on the classic mens wallet. Show it off on your next day at the races or while enjoying your strawberries and cream at Wimbledon. Sadly, we cant all drive home in a British Racing Green Jaguar, but you can own the matching wallet. A huge thank you for my wallet , it arrived yesterday and it’s perfect . Nice to see a company that actually are first class .